Picture taken by Vir Nakai, Adventurer, Biker, Co-founder of Helmet Stories. I last visited Manali in the summer vacation of Class 7. As part of the tour, we were taken to Hadimba temple. While the rest of the group was busy at the temple, my father walked to the woods behind the temple and we followed suit. The trees were so tall, as if they had stretched themselves to reach out for the sun. As I turned around, all I could see was these never ending woods till the end of my vision. I may have twirled some more in the sheer ecstasy of being amidst the mountains. This was the start of a love story with the Himalayas and probably the only memory I had of Manali. Amidst professional exams and college crushes, this love story was just a memory, until I came across pictures of Co-survivor on Facebook.Shot by ace Photographer Rohit Chawla, the images lure you into visiting the mountains. It is as if his pictures speak to you. Rohit has extensively photographed Parvati Valley, Kasol, Kheer Ganga, the Kullu Valley around Manali. I knew the mountains were calling, I took advantage of the discounts offered by the airlines and scheduled a trip during the Dassera week in October. A day before Dassera, the flight took me from Bombay to Chandigarh. Followed by an 8 hour drive through NH 21, I reached Old Manali at 9.30 at night. The next day, in my attempt to seek familiarity, I walked to Hadimba temple. Old Manali has narrow sloping roads lined with cafes and shops, there is a bridge over the Beas River which connects Old Manali with New Manali. A good 2km walk later, I reached the temple. It was Dassera and there was a line outside waiting to take blessings on the festive occasion. I skipped the line to look out for the magical woods right behind the temple. While the trees were still there, my view was interrupted with barbed wires, residential developments, boards and benches. I turned around to see the uninterrupted vision from another angle, but alas. There were urban developments, from hotels enroute the path to the temple to people clicking pictures with mountain rabbits. This path had been completely forested on my last visit and I wondered how an animal as quick as the rabbit could stay still to pose for a photograph. Later that day, I met Rohit. He has been spending every summer around the area regularly since 2007 and has seen the hill town transform. When he asked me what I wanted to do in the course of my trip, all I wanted was to see the Manali I had seen in school; uninterrupted views of the woods and snow capped mountains. He gave me a hermit like nod and we bid goodbye. The next day I was introduced to the Co-Survivor crew. Saurabhis a rock star in literal terms. Wearing glares in which I could see myself in a blue lenses, he shared some fabulous stories from his travels. Sachinis a marathon runner apart from being the adventure enthusiast. Over breakfast at Thapa’s, plans for a bike trip were brewing. As I could smell the warmth of ginger lemon honey in the air, I could also smell adventure! We decided to go to a place called Bijlee Mahadev. This is a Shiva temple on the top of a hill. Once in a year, lightning strikes the Shivling inside the temple and it is broken into pieces. The villagers collect the pieces and seal it together with barley, ghee, milk, rice. The locals have alot of faith in the phenomenon. Geared up with biking jackets, helmets, reinforcements for the knees and elbow, we took off on 3 bikes. Driving out of old Manali, we passed by the Beas river and I could see a secret getaway into the woods on the other side of the river bank. The views of the snow capped peaks opened up as we drove further. Accompanying us on this mountain biking trail were 3 Royal Enfields, two 350cc Classic and one 500cc Machismo. These bikes have travelled with the Co-Survivor crew across Ladakh, Kashmir, Spiti Valley, Uttarakhand. Bijli Mahadev is situated at approximately 2500metres above sea level. 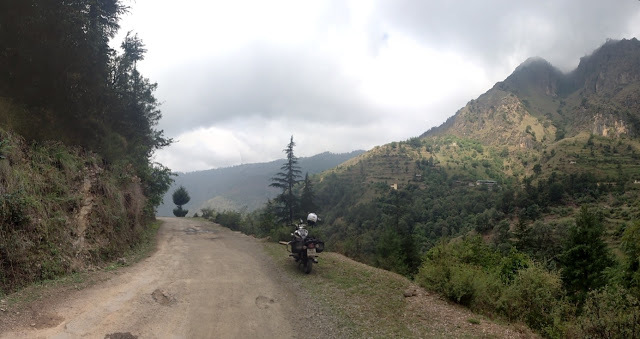 The route took us from Manali via Naggar– Jana Village(11km) and then onto the temple (18km). Co-Survivor shared snippets about the life of the locals as we passed by the villages. As winter was approaching, we passed by women carrying dry grass. This is laid on top of roofs of their home to serve as insulation from the cold. In some places, there was corn drying on the roof tops. This was to stock up on food for the extremely cold season ahead. Many a times, if the snowfall is heavy, Manali loses its connectivity digitally and physically. Therefore, the winter season requires the locals to be well prepared. Every now and then, the view ahead would leave us in awe. It was akin to savouring every layer of a dessert. After a ride of approximately 2 hours, we reached the base of Jana village.We were greeted by a waterfall and just over the moor was a set-up for tea. Refreshed with hot cups of pahadi chai, we continued the ride ahead. That is when Co-Survivor gave me a heads up. The road ahead is rocky for about 10km. It will take us an hour to cover that distance. As we drove ahead, we passed by trees which were laden with apples, in golden and red. Apples are not a crop intrinsic to Himachal Pradesh. It is only in the last hundred years, the fruit was brought in by the British for whom it was too expensive to keep importing apples from England.The state has started growing the fruit due to the benefits they derive from it. Also, the farming practice is not organic. In order to ensure the practice is commercially viable, pesticides are used to protect the fruit. We passed by structures which were akin to homes high up in the mountains. It wasn’t a cluster of homes, but a single structure with the signature style of mountain architecture, made with wood and stone. Co-Survivor explained that the locals build these homes to keep the harvest. It helps buy time, by the time the fruit can be transported from the mountains to the road. The road was challenging for both the riders. The one in front had to drive with focus and stay alert of and on the sharp turns. The other rider had to maintain balance and ensure she doesn’t fall off the bike with the impact of the rocky road! Co-Survivor shared that I should stand when the road gets too rocky. I saw the bikers in front of me and followed suit. Riding on a rocky road was interesting, but standing while the bike was in motion, this was the beginning of my Manali adventures! As we drove further up, the views of the valley only got better. Co-Survivor then pointed out the uninterrupted views of the pine trees up ahead. And I was in the Manali I knew in school. All I could see was this vast stretch of trees standing beautifully together. The changing colours of autumn added shades of red, orange and golden amidst the green and all I could do was smile in glee. These uninterrupted views stayed with us for most of the ride and I could take in the beauty of the landscape ahead as much as I wanted. That is when I understood the hermit like nod of Co-Survivor! It is overwhelming to be amidst so much beauty and I bow down in gratitude to the forces for such experiences. I realised that there were Zen like moments, when I was in rhythm with the road and the wind while riding. Amidst standing high and sitting low, we came upon a stretch which looked like a deep puddle. The experienced bikers of the Co-Survivor crew kept safe distance, let one bike pass by so that the slush would not splash on the following bike. The pillion riders got off the bike and crossed over this patch, stepping on supporting rocks to stay dry. After some more tough, rocky terrain riding, we reached the top of the mountain, which was a plateau with pastures for sheep, a dry lake, temporary food set-ups and a path that led to the temple Bijlee Mahadev. The walk up hill to the temple was a pleasant break and helped stretch the tired muscles. The temple architecture is similar to most mountain temples.Like most Shiva temples in the mountains, faraway with a dazzling view, old stone architecture, a small door going inside to the Shivling, slabs so huge they make one wonder how they were even carried and placed them up there! I connected the story told to me earlier with the Shivling ahead of me. It was in colours of stone and white and much bigger than the ones I have seen in other temples. Bowing my head in gratitude, I stepped out to be awaited by more awesomeness. We walked 200 metres ahead of the temple to the edge of the mountain and took a few steps down the slope. Saurabh found a landing of sorts from where the entire Kullu valley was visible. Co-survivor pointed out to the runway of Kullu Airport. This is operational subject to weather conditions. The view from atop made the valley look like a Lego township in colours of green, blue and grey. We also saw the road from Kullu going in to Parvati valley.The crew shared stories of their heroic trekking trip from this mountain to Parvati Valley, completed over 3 days. We walked back to eat some lunch. As I helped myself to some hot-hot Maggi in the mountains, I saw local women walk down an alternate route to the base. It is amazing to see how sure footed they are on a path where city folk would tread very carefully. With some beautiful views of the snow capped mountainslike Deo Tibba and Indrasan. They were barely visible, though on a clear day one can see Parvati and more from that valley. On the other side one can see the entire Bara Banghal range and Hanuman Tibba farawayfrom the plateau. We bid adieu to Bijlee Mahadev and started the ride to the base. Co-Survivor alerted me about being more careful enroute the downward slope. To be honest, I was scared. But once into the ride, I could stand better this time. Co-Survivor’s riding and the renewed confidence reduced the fear. With the sun beginning to set, the sky was beginning to turn into a canvas in colours of orange and pink. At one time, there was this fluorescent pink streak in the sky akin to the northern lights in the Arctic circle. It also resembled the cover of trance music labels, lending it that trippy feeling. We stopped at a flat stretch of the path to admire this awesomeness in silence. The ride down took lesser time and in about 2 hours, we were back at the base. We took a break for chai and amidst sips of this warm ginger brew, I could hear the ripples of the waterfall. A pleasant break for the quads and the calves; although I was standing in the tough patches, this was one mean adventure ride. I thought of Princess Mriganka Singh of the royal house of Jammu and Kashmir who is a bike enthusiast. She was intrigued by Anne Hathaway riding Batman’s bike in The Dark Knight Rises and is getting a dirt bike customised for herself. While this marked the end of my first off road bike trip, I knew this was just a start. As we got on to the road, the views of the valley were akin to what we see from the window of a flight. Like a fairy land with shining lights. The bike we hired got a little more tired than all of us. The bike kept turning off. Saurabh and Sachin explained that due to the rain getting into the wiring, they were facing an electrical issue.As the rock star crew were working on getting the bike running, we discussed plans for dinner. The adventure had not ended yet. A little after Naggar we were welcomed by rain followed by hail. The temperature dipped and the winter layers were a boon. It was nice that we were wearing helmets, so while I heard the sound of hail, it did not hit my face or head.It is best to wear a helmet for both the rider and pillion; in the scenario that you haven’t, the hood of an all weather jacket can also protect your head from the hail. After an awesome warm dinner which included ginger lemon honey, hot-hot soup, parathas with Dal makhni, I finally made it to my guest house. With hurting legs and awesome memories, all I could do was sleep deep to recover and be ready for more adventure the next day. P.S. They say a camera cannot capture what the human eye can. Amidst learning to balance myself on a dirt road, standing up on a riding bike and taking in the beauty around; I was not able to take pictures on this journey. I leave it to your imagination to visualise the magic and hope you experience it someday.